A method for combining physiological measurements from two or more independent measurement channels, particularly physiological measurements such as heart rate. Independent measurements of heart rate, for instance by ECG and pulse oximetry, can be combined to derive an improved measurement eliminating artefacts on one channel. A model of the process generating the physiological parameter, e.g. the heart rate, is constructed and is run independently for each channel to generate predictions of the parameter. The model may be a Kalman filter. The measured values are compared with the predicted values and the differences is used as an indication of the confidence in the measurement, the higher the difference the lower the confidence. The measurements from the two channels are combined using weights calculated from the respected differences. Certain parameters can be measured in more than one way. This is useful in giving independent measures of the same quantity. For instance, in the medical field the heart rate can be measured both from an electrocardiogram (ECG) and from a pulse oximetry waveform (used to calculate oxygen saturation). drawings FIG. 4 illustrates schematically these-two-waveforms, FIG. 4 a being the electrocardiogram with the heart rate illustrated as HR1, and FIG. 4b the pulse oximetry waveform with the heart rate illustrated as HR2. The heart rate is a parameter which can undergo sudden changes. Some of these changes are valid physiological changes, for example ectopic beats which occur prematurely, and therefore give rise to a temporary increase in the heart rate. FIG. 5 illustrates the occurrence of an ectopic beat 50 found in both the electrocardiogram trace and the pulse oximetry waveform. The shorter interval between the preceeding beat and the ectopic beat 50 manifests itself in a measurement of the heart rate as a sudden increase in the heart rate. FIGS. 1 and 2 of the accompanying drawings show time plots of the heart rate measured by pulse oximetry (FIG. 1) and ECG (FIG. 2). It can be seen that in FIGS. 1 and 2 the heart rate in. the early part of the plot is generally of the order of 80 bpm, but that there are occasional sudden increases in heart rate, such as indicated at 10 and 20 which are caused by ectopic beats and thus appear both in the measurement by pulse oximetry and the measurement by ECG. However, in addition to changes in the measured heart rate deriving from valid physiological changes, other changes occur which are not physiologically valid, for instance being caused by sudden movement of the sensors on the body surface (e.g. chest movement with ECG electrodes). FIG. 6 illustrates the presence of artefacts  60 on the pulse oximetry waveform which shorten the interval between apparent beats and thus result in apparent increases in the heart rate. These changes are reflected in one measurement, but not the other, as indicated at 12 and 22 in FIGS. 1 and 2 respectively. The fact that the changes appear in one measurement but not the other means that the two measurements could be combined to help decide which heart rate changes are valid physiological ones, and which are artefacts. However, the normal approach of validating one measurement channel against the other involving cross-correlation of the two measurements invariably fails because it is not possible to know in advance (for each recording, for each patient) what value to give to the threshold for accepting, rather than rejecting a change in the heart rate as being valid. Thus although it would appear from FIGS. 1 and 2 that a threshold could be set which would eliminate changes such as indicated as 22, such a threshold is not appropriate for all patients for all recordings, and does not help with the pulse oximetry waveform. The problems are increased in the event of atrial fibrillation when the heart rate changes rapidly as indicated in the region AF in FIGS. 1, 2 and 3.
where M 1 and M2 are the two measured values, and σ1 and σ2 are the differences between the two measured values and their respective predicted values. It will be appreciated that the invention can be embodied using computer software and thus the invention extends to a computer program for controlling and executing the method or parts of it, and to a computer readable storage medium carrying the program. The invention also extends to corresponding apparatus for carrying out the method. FIG. 10 illustrates the variance obtained from FIGS. 7 and 8. An embodiment of the invention will now be described in which the invention is applied in the medical field to the measurement of heart rate using ECG and pulse oximetry. As illustrated in FIG. 4a the heart rate measured by ECG is derived from the interval between two successive R-wave peaks. The heart rate measurement derived from the pulse oximetry waveform is obtained from the interval between two successive peaks (or troughs) as illustrated in FIG. 4 b. FIGS. 1 and 2 illustrate heart rate plots derived from these two measurements. where ε t+1 is the difference between the actual value and the predicted value: the innovation. 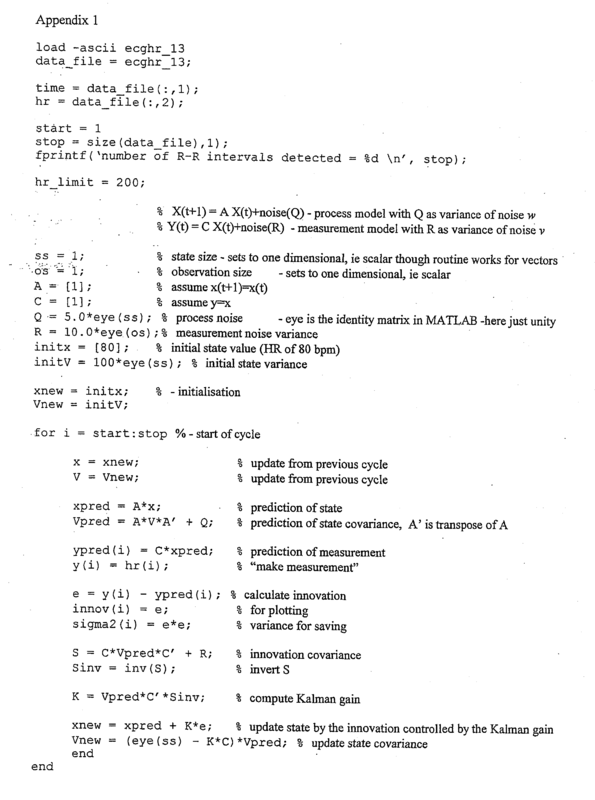 An example of an implementation of this model in MATLAB is given in Appendix 1. That example is general, and will work for vector quantities, though in this embodiment the quantities are scalar. It can be seen from appendix  1 that the predicted heart rate for each new measurement cycle (xnew) is equal to the previously predicted value (xpred) plus the Kalman gain K times the innovation e. The Kalman gain K is derived from the predicted variance Vpred and the measurement variance R. The predicted variance is derived from the previous predicted variance and the process noise Q. To start the process off it is initialized using an initial value of the heart rate as 80 and an initial value of the state variance of 100. The process noise in the Q in this embodiment is set to 5 and the measurement noise variance R is set to 10. FIGS. 8, 9 and  10 illustrate values for the estimated heart rate xpred, the innovation e and the variance σ2 for the heart rate plot shown in FIG. 7 (in this case the ECG measurement channel). FIG. 3 illustrates the result of combining the two measurement plots from FIGS. 1 and 2 using this embodiment. It can be seen that the movement artefacts  22 on the ECG channel in FIG. 2 have been removed from the combined measurement, even though they occur during a period of atrial fibrillation. 1. A method of measuring a parameter comprising the steps of: predicting the value of each of two independent measurements of the parameter, making two independent measurements of the parameter to produce two measured values of the parameter, calculating the respective differences between the predicted values and the measured values, and combining the two measured values with weights determined by said differences. 2. A method according to claim 1 in which the steps of prediction, measurement, calculation and combination are repeated continuously, the predicted value for each of the two independent measurements being based on the preceding predicted value and the difference between the preceding predicted value and the preceding measurement. 3. A method according to claim 2 in which the predicted value for each of the two independent measurements is calculated by using a linear predictive model. 4. A method according to claim 2 in which the predicted value for each of the two independent measurements is calculated by using a non-linear predictive model. 5. A method according to claim 3 or 4 in which the model is adaptive, and it adapts in dependence upon the amount of process noise in the measurements. 6. A method according to any one of the preceding claims in which in the step of combining the two measured values the weight of each value varies inversely with the square of the difference between the predicted value and the measurement. where M1 and M2 are the two measured values, and σ1 and σ2 are the differences between the two measured values and their respective predicted values. 8. A method according to any one of the preceding claims in which the predicted values for the respective measurements are based on respective models of the system. 9. A method according to claim 8 in which the models of the system include estimates for process noise and sensor noise. 10. A method according to claim 8 or 9 in which the respective models of the system are mutually independent. 11. A method according to claim 10 in which the respective models of the system include the same estimates for process noise and sensor noise. 12. A method according to claim 8, 9, 10, or 11 in which the respective models of the system are Kalman filters. 13. A method according to any one of the preceding claims further comprising the step of discarding series of measurements for which the differences between both measured values and their predicted values exceed a predetermined threshold for a predetermined period of time. 14. A method according to any one of the preceding claims in which the parameter is the heart rate. 15. A method according to claim 14 in which the two independent measurements are made from an electrocardiograph and a pulse oximetry waveform. 16. A method according to claim 14 in which the two measurements are made from a multiple lead ECG recording. 17. A method according to any one of the preceding claims in which there are more than two measurements. 18. A method according to any one of the preceding claims further comprising the step of identifying movement artefacts based on the values of the differences between both measured values and their predicted values. 19. A computer program comprising program code means for executing the method of any one of the preceding claims. 20. Apparatus constructed and arranged to execute the method of any one of claims 1 to 18. DE68916803D1 (en) 1989-12-23 1994-08-18 Hewlett Packard Gmbh A process for obtaining a respiration signal and / or a Herzstörsignal from a physiological signal. Lu et al. 2008 Can photoplethysmography variability serve as an alternative approach to obtain heart rate variability information?